Seeing the recent discussions about Carden School reminded me that I have this press cutting in the collection I inherited from my mother. It is from one of the local papers and dated November 13th 1948. Apologies for the quality of the picture but it has been pasted into a scrapbook for over 60 years. The cutting shows some of the the dignitaries who attended the official opening of Carden School. 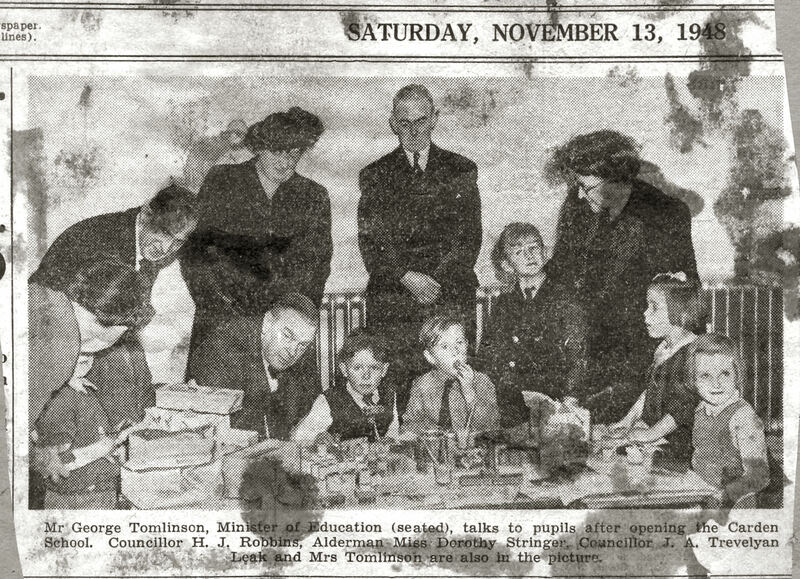 Seated with the children was the then Minister for Education, George Tomlinson. Also in the photograph is my grandfather, Horace Robbins who was the Deputy Chairman of the local Education Committee; Alderman Dorothy Stringer and Councillor Trevelyan Leak. It is a long time ago, but do you recognise any of the children here? Did you attend Carden School in those early days? If you can share your memories with us, please leave a comment below. Having been to The Keep lately on family research, I discovered that at the meeting of the Education Committee on the 12 Oct 1948 it was announced that “The formal opening by Minister of Education (The Right Hon George Tomlinson MP) of the newly erected Carden School will take place on Weds 10 Nov 1948 at 3pm”. That ties in exactly with the photo above.